Thousands of the world's foremost experts on artificial intelligence, worried that any technology they develop could be used to kill, vowed Wednesday to play no role in the creation of autonomous weapons. "This may have some impact on the upcoming United Nations meetings on autonomous weapons at the end of August," said Paul Scharre at the Center for a New American Security and author of "Army of None," a book on autonomous weapons. "But I don't think it will materially change how major powers like the United States, China, and Russia approach AI technology." The researchers announced their opposition during the International Joint Conference on Artificial Intelligence in Stockholm. The Future of Life Institute, an organization dedicated to ensuring artificial intelligence doesn't destroy humanity, drafted the letter and circulated it among academics, researchers, and others in the field. "Artificial intelligence (AI) is poised to play an increasing role in military systems," the letter states in its opening sentence. "There is an urgent opportunity and necessity for citizens, policymakers, and leaders to distinguish between acceptable and unacceptable uses of AI." Military use, the letter states, is patently unacceptable, and "we the undersigned agree that the decision to take a human life should never be delegated to a machine." Machines that think and act on their own raise all sorts of chilling scenarios, especially when combined with facial recognition, surveillance, and vast databases of personal information. 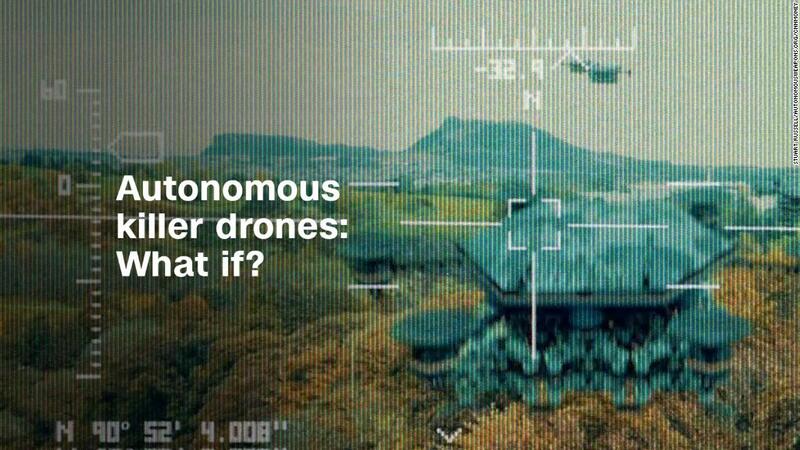 "Lethal autonomous weapons could become powerful instruments of violence and oppression," the letter states. Many of the leading US tech companies are grappling with the very issues the Future of Life Institute (which is funded in part by Elon Musk) raises in its letter. In June, Google (GOOG) CEO Sundar Pichai outlined the company's "AI principles," which make clear that the company will not develop any tools for weapons designed primarily to inflict harm. The announcement followed an employee backlash against Google's role in a US Air Force research project that critics considered a step toward autonomous weapons. Jeff Dean, Google's head of AI research, is among those who have signed the letter. Aguirre said he's hopeful that major companies will add their names to Wednesday's letter, or at least follow Google's lead in stipulating where and how its AI technology can be used. "There's a limited window between now and when these things really start to be widely deployed and manufactured," Aguirre said. "Consider nuclear weapons —lots of people would like to not have them, but getting rid of them now is extraordinarily hard."